The next book in the Christmas countdown is one close to my heart. At least, the original is close to my heart. It’s the follow on book from The Jolly Postman. It’s the Jolly Christmas Postman and it’s just heartwarming. Now some may find the idea of a human postman delivering post to domesticated animals a little disconcerting, but come on people it’s a picture book; the epitome of the disconcerting. But it’s the imaginative that you embrace when you open up a picture book and it reaps rewards if you do it with an open mind. What I love about this book and indeed, the original is the interactive element as we open the post delivered to each character (I wont dwell on the face we are surely breaking some privacy laws here) Janet and Allan Ahlberg are you the reason behind the tragic youth of today? 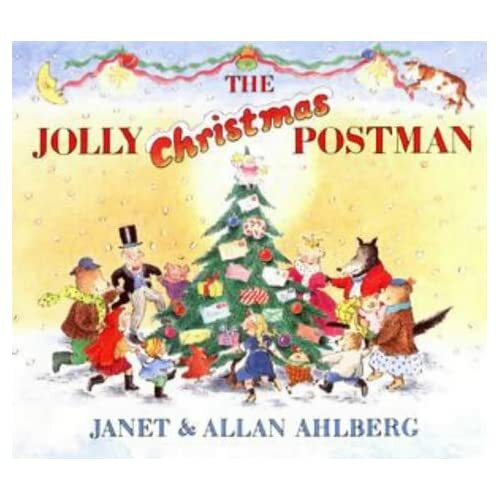 Another aspect of the book to ignore is the fact that the jolly postman is delivering letters on Christmas Eve. This does not happen, but again I digress. The Ahlberg’s have once again triumphed as this innovative book will please any child learning the fairy tales and nursery rhymes. Little Red Riding Hood and Humpty Dumpty are the highlights for me. An uplifting, unceremoniously British picture book which reminds the adults to get to the post office in good time. Whilst I’m on the subject of short fairy stories, may you take the time to visit this lovely gem of a blog. I don’t know the creator of this blog but they took the time to refer to my blog and I of course checked theirs out and I’m glad I did. It’s right up my street. Apologies for the lack of updates, Christmas preparations got the better of me. But as Christmas comes ever closer, try and find some time to curl up with the kids (by the fire is preferable since it’s so cold at the moment) and indulge in a little fairy story by the evangelical (in my eyes) Michael Morpurgo. The Best of Times is a charming story of a Prince who really does care for his sad Princess. It’s a lovely old time tale of chivalry and reminds us that people need caring for and we must not lay idly by as people are sad. What makes this story however are the illustrations by Emma Chichester-Clark. She is most famed for her classis stories of Blue Kangaroo and her style is fast becoming as recognizable as dear Quentin Blake’s.